When to go, what to do, and where to stay. Originally appeared in the January 2016 issue of Virtuoso Life. Fly into Bari or Brindisi from any major European capital, or take a train from Rome. 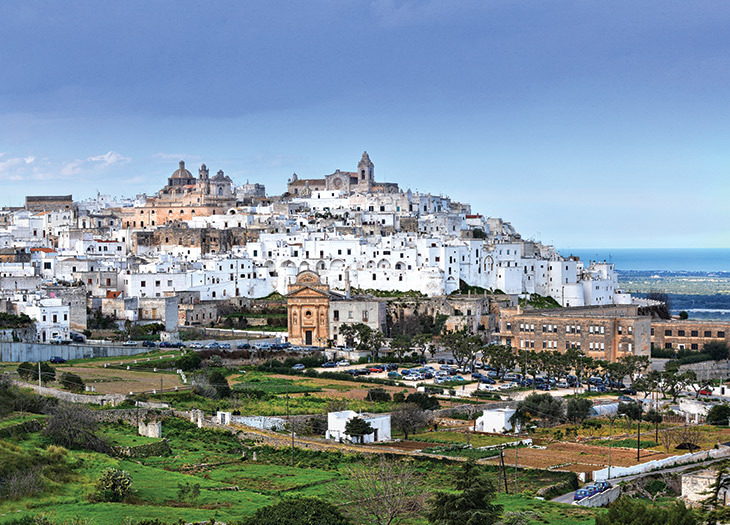 Once you’re there, advisors recommend renting a car: “Puglia offers so many day trips,” notes agency executive Mike Kempinski. Consider Puglia for a pre- or post-cruise tour: Many Mediterranean itineraries call on Bari, and an extended stay allows you more time to explore. Puglia is perfect for a bike tour, which your advisor can arrange. “The roads are flat, and there are a lot of coastal routes,” says travel agency CEO Paul Largay. “The area is respectful of and accustomed to cyclists, and the traffic is lighter than in most other Italian destinations. Hard-core riders can add in some challenging hills to the base rides,” he adds. 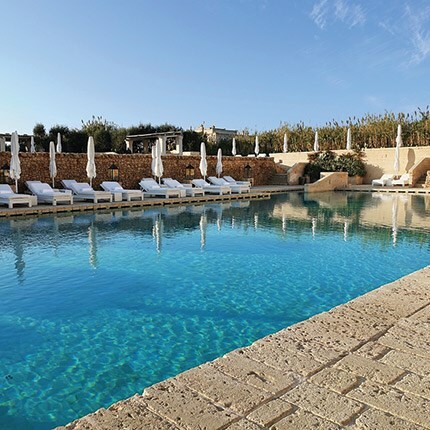 The Melpignano family welcomes visitors over the age of 12 to their elegant residence-turned-hotel, Masseria San Domenico, a gem with a spa, a huge pool, an outstanding restaurant, and 40 traditionally decorated guest rooms. The historic masseria (farmhouse) boasts a watchtower built in the fifteenth century and used by the Knights of Malta. Masseria San Domenico’s more modern sister, Borgo Egnazia, was meticulously designed and decorated to highlight local materials and, more important, the local way of life. The 183 accommodations range from guest rooms to townhouses and spacious villas. Owner Francis Ford Coppola curates every detail at the nine-room Palazzo Margherita. The living area doubles as a screening room, where you can eat pizza and drink wine while watching one of his favorite Italian films. The bar is for hotel guests only, but the restaurant is a local favorite. Opt to eat in the kitchen, and take a complimentary pasta-making class.